History clearly indicates that as industrial capitalism flourished, handcrafts declined. Nevertheless, individual craftsman play a strong role in culture and society by exploring the gap left from the rise of mechanization, and maintaining balance. This sculpture depicts these contrasting values. 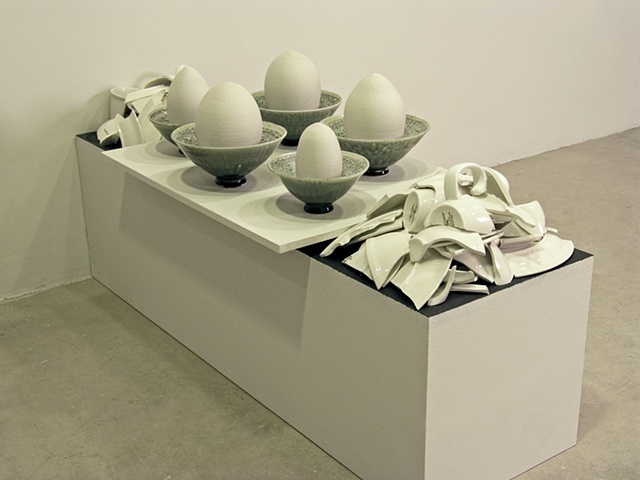 Amid the heap of broken shards is a group of bowls cradling an egg within their internal space. The pile of broken shards surrounding the bowls used to be a set of dinnerware purchased for about ten dollars.